To view the Task Rule record viewer, select Utilities > CRM > Task Rule from the TeleTracker Online menu bar. 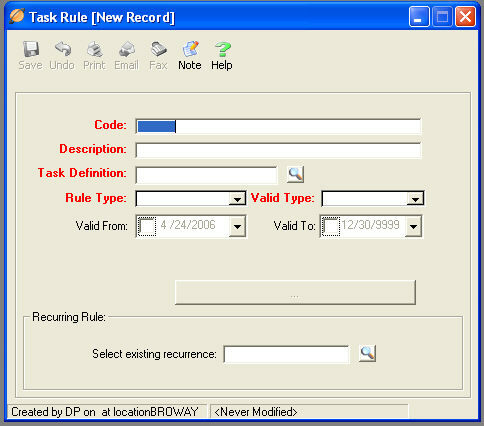 The Task Rule generates Tasks for TeleTracker Online users based upon customizable configurations. All items marked in RED are required fields and must be populated before the Task Rule can be saved. Description : This field is used to further describe your Task Rule code. Task Definition : Identify the appropriate Task Definition to apply to this Task Rule. Remember, the Task Definition contains information for the TeleTracker Online user. A Task Definition with a type of Contact should be selected when creating a new Task Rule. You may create a new Task Definition by clicking the Task Definition lookup icon. Click the New icon located on the TeleTracker Online toolbar. For further information when creating a Task Definition, visit the Task Definition help file. Post Activation Rule Type: This Rule Type creates a Task after an activation is performed within TeleTracker Online. Valid Type : The Valid Type drop-down list identifies the specific activation entity you would like the Task Rule to be created by. With the example seen above, you can create a Task Rule that will create a Task with every activation with a New activation type. You will be given the opportunity to select the appropriate activation type(s) by clicking the Select Activation Types button. This button will function in accordance with the selection of the Valid Type drop-down list. Alert : Because the Rule Type is identified as 'Post Activation' the alert field identifies the # of days the task is created after the activation. If the alert field is set to 0 days, the task will be created as soon as the Invoice is saved. Select Activation Types : Click this Button to select specific Activation Types. Only Activation Types placed in the Selected column will create a task when a plan is activated. The label and functionality of this button will change depending on what is selected from the Valid Type drop-down list. Ending Contract Rule Type: This Rule Type creates a Task when an Activation performed within TeleTracker Online expires. The Ending Contract Date is determined by the Activation Date and the contract period activated on the Invoice. With the example seen above, you can create a Task Rule that will create a Task with every activation that has a New activation type. You will be given the opportunity to select the appropriate activation type(s) by clicking the Select Activation Types button. This button will function in accordance with the selection of the Valid Type drop-down list. Alert : Because the Rule Type is identified as 'Ending Contract' the alert field identifies the # of days the Task is created before the contract period ends. If the alert field is set to 0 days, the task will be created when the contract period expires. Select Activation Types : Click this Button to select specific Activation Types. Only Activation Types placed in the Selected column will create a task when a contract period ends. The label and functionality of this button will change depending on what is selected from the Valid Type drop-down list. Deactivation Rule Type: This Rule Type creates a Task when a Deactivation is performed within TeleTracker Online. Alert : Because the Rule Type is identified as 'Deactivation' the alert field identifies the # of days the Task is created after the Deactivation occurs. If the alert field is set to 0 days, the task will be created when the Deactivation transaction is saved. Product Rule Type: This Rule Type creates a Task when a Product(s ) are placed on an Invoice or Return. With the example seen above, you can create a Task Rule that will create a Task with every invoice in which the Selected Products are sold. You will be given the opportunity to select the appropriate Product(s) by clicking the Select Products button. This button will function in accordance with the selection of the Valid Type drop-down list. Alert : Because the Rule Type is identified as 'Deactivation' the alert field identifies the # of days the Task is created after the product is sold or returned. If the alert field is set to 0 days, the task will be created when the transaction is saved. Select Activation Types : Click this Button to select specific Product(s). Only products placed in the Selected column will create a task. The label and functionality of this button will change depending on what is selected from the Valid Type drop-down list.